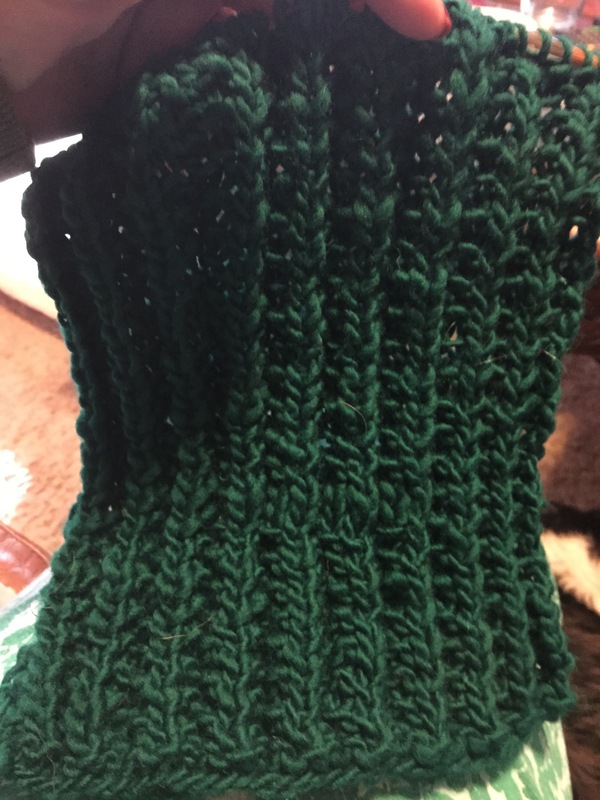 How do you get yourself out of a knitting rut like the writer describes below? I have just recently finished up several UFO’s, and now I am looking at starting something new as a reward.. More about that in a later post. If you’ve been knitting for a longer amount of time – long enough that you’ve done enough knitting projects to think of yourself as “A Knitter,” then you may every so often start to find yourself in a rut. You still love knitting, you still look fondly at the yarns on your shelf and the projects you’ve made, but you’re just not feeling as excited about it at this particular moment. You want to push past that feeling and get back to feeling excited about your knitting again. I have completed 44 inches of the scarf I am making. I think I may have another 10 inches to go before I bind off! Woo Hoo! I am SO close to being finished! It really is turning out beautifully. 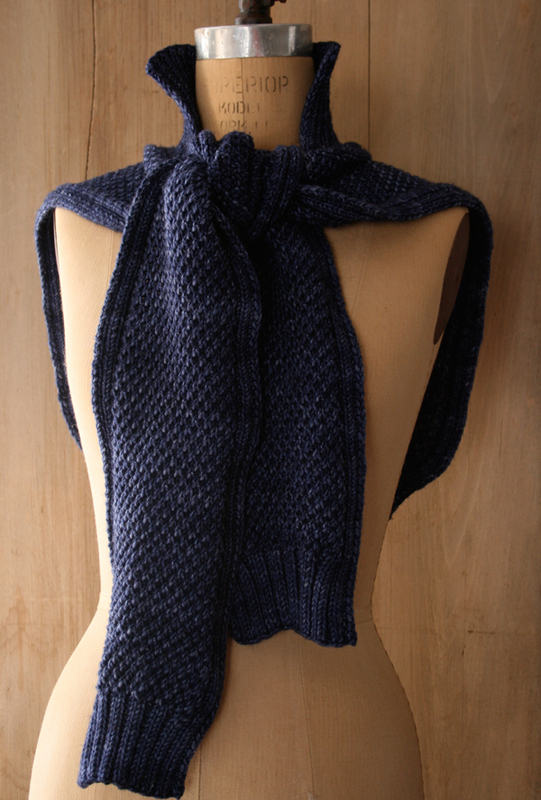 I love the stitch definition of the ribbing, how fluffy it is and how lofty, too. 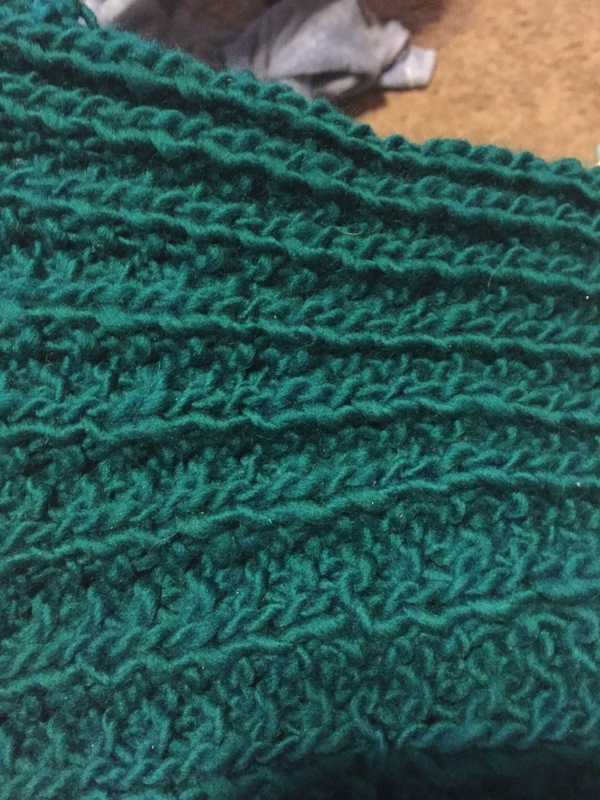 Can you see how pretty the ribbing looks? It looks different from any other ribbing that I have done and the weight of the scarf is heavier than a normal scarf. It comes up to my hips now, and it is just beautiful to me. I can’t wait to get it in the mail to Dina. I think she will love it. On another note, my stepmom loved her afghan! She was very pleased with my color choices and how it turned out. She said that she was cold all of the time these days so this afghan will get some use for sure! I knew that I was pleased with the way it turned out, but it is very gratifying to know that she loved it too. How many of you sell your knitted items? How many of you sell your stash? I am about to list some of my stash for sale on eBay. I will keep you posted for the link to my eBay auctions. I really need to sell some of it. It is humongous and it needs to be pared down to something more reasonable. I have so much to sell. I just hope that I can sell it for a reasonable price. So, if you need some yarn wait for my auctions and buy from me. 🙂 Thank you! Hot Pink Yarn for Sale! 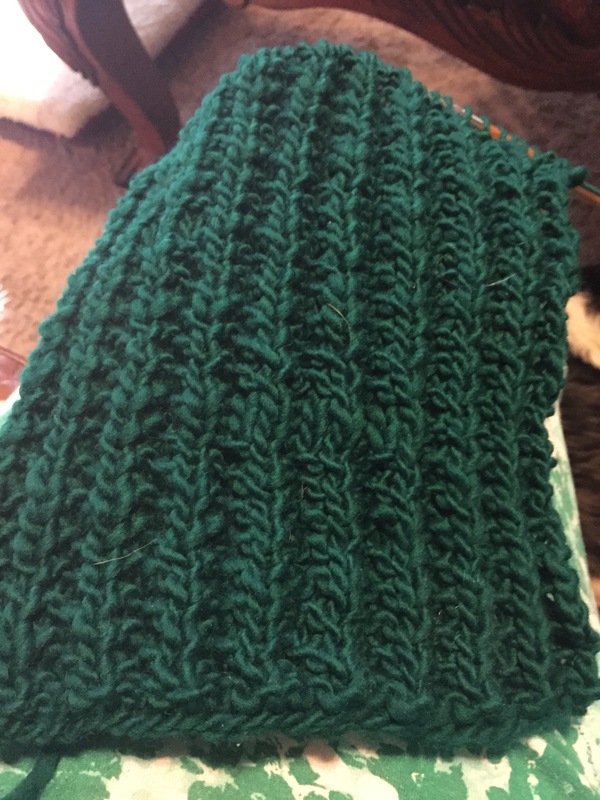 My latest project is a scarf! I haven’t made a scarf in a long time, mainly because they bore me to tears. In this case, I am making another scarf to match the first one that I made for my former supervisor, Dina. She is married, so I thought it only fitting that I make her partner a scarf that matched hers in every way except color. The first one I made was a periwinkle color, and this one is a beautiful emerald green color. I think the emerald green would go well with Dina’s coloring but it will be totally up to her which one she chooses. Even though I have not seen a picture to know what color would go best with each person, I am sending both to Dina and she can decide which one she wants to use. She gets first dibs.. LOL.. I hope that she likes them as much as I liked doing them for her. I made her first grandchild a baby set when she was born 2 years ago now and Dina just had a fit over it. I love knitting for people who appreciate the effort that it takes to knit anything for any specific person. Dina loved the baby set so much that I thought that she would enjoy having a scarf made for those brutal Chicago winters that they have there. I think she will enjoy using one or both of them.. 🙂 I can’t wait to finish this one and get them both in the mail to her. She is not expecting either one of them so they will be a total surprise for her! YAY!! Unless of course, she stumbles upon my blog.. Ooops! Here’s hoping that she doesn’t stumble upon my blog. She crochets so hopefully, she won’t be looking at knitting blogs. It can be either a feminine scarf or a masculine scarf depending on how long you make it I think. This pattern calls for it to be 8 inches wide x 48 inches long, and given Dina’s height that would be perfect for her to be able to wrap it around her neck once or twice. I may make it longer just because. I guess it will depend on how bored I get with it by the time I reach 48 inches.. I will probably start a pair of socks or some other project to break the monotony of this scarf. (See below.) It took me a while to finish the first scarf because I put it away for a LONG time before I decided to get it back out again and finish it to get it off my needles. I recently finished an afghan for the same reason. They had both been on my needles for over a year, maybe even a year and a half, before I pulled them back out to finish them. I finished the periwinkle scarf first because that was the closest to being finished, and then I pulled out the afghan to finish it. I finished that last week and posted about it here on my blog. I am seriously considering starting a new pattern, again by PurlBee Soho that is what I call a partial sweater. It has arms, back, and neck but nothing else and it looks like a sweater that you could tie around your neck, pairing it with a buttoned down shirt or another sweater. You have to see the picture to visualize what I am talking about. See it here and get your free pattern too! Isn’t that just the coolest thing you have ever seen? It is, IMHO, an ingenious idea! Seriously! The pattern looks like it will be challenging but not so hard that I cannot do it. I haven’t ever done a brioche stitch, so I will learn something new with this pattern as well. I think I could make it without too many problems. My bestie, Therese, tells me that it would be a perfect fit for her! Ya think? She doesn’t get too cold in the NC winters, at least not cold enough to warrant wearing a whole sweater, so she tells me that this would be perfect for her. We shall see if I attempt to make it for her. Time will tell. Of course if I am going to attempt it, I need to get cracking on it cause Christmas is coming up fast! I don’t know that I would get it made by Christmas. I would have to work on it pretty much nonstop in order to complete it by then. I am such a slow knitter. I also have to find the right yarn for it in my stash. THAT I think I can do just fine because my stash is huge! I will just have to take a lot of it out to see it all spread out and see what I have to work with. I have so much yarn that I don’t remember it all. Hence the spreading it out to look and see what I have. There really is no rhyme or reason to it, no organization. Just yarn put into those huge Space Saver bags and vacuumed down to remove all the air out so that I could stack the yarn on top of each other in my closet. When I open my closet the yarn comes tumbling out. I have gotten more yarn since I did the Space Saver bags about 2 years ago, and I need to put that yarn in a bag and condense it as well. I won 50 hanks of yarn and a Jordana Paige Quinn bag about a year and a half ago now, and that is sitting on top of all of my other yarn which makes it slide out onto my carpeted floor when I open the closet door. I need to figure out a new system of indexing it all so that I can know what I have at any given time. Any ideas from my reader’s? If so, please post them in the comments! Thank you so much! Anyway, this is what I am working on and contemplating starting. What are you working on right now? What is in your to-be-completed pile and why haven’t you finished yours yet? I get bored with mine and put them in the pile, but I rarely put where I am when I do that, so I have to read my stitches to find out where to pick up and start again. Note to self: Start pinning a piece of paper to each incomplete project with the row number you are on and the stitch pattern you are using. Maybe you could even pin the actual pattern to the project so that you know where you are and what you are making! Keeping notes is essential if you put things in a to-finish pile! Woo Hoo! I am done with the afghan! I finally finished weaving in the ends on my Cromwell Court afghan this afternoon! I am so excited to have it finished and off my needles! It was a long project, and I am glad to be done with it. Now when I go to see my step-mom, Rachael, I can bring it to her and give it to her. I know it is still summertime in NC and hot as Hades, but the winter is coming.. So, she can put it up until then. It is being washed as I type this post. 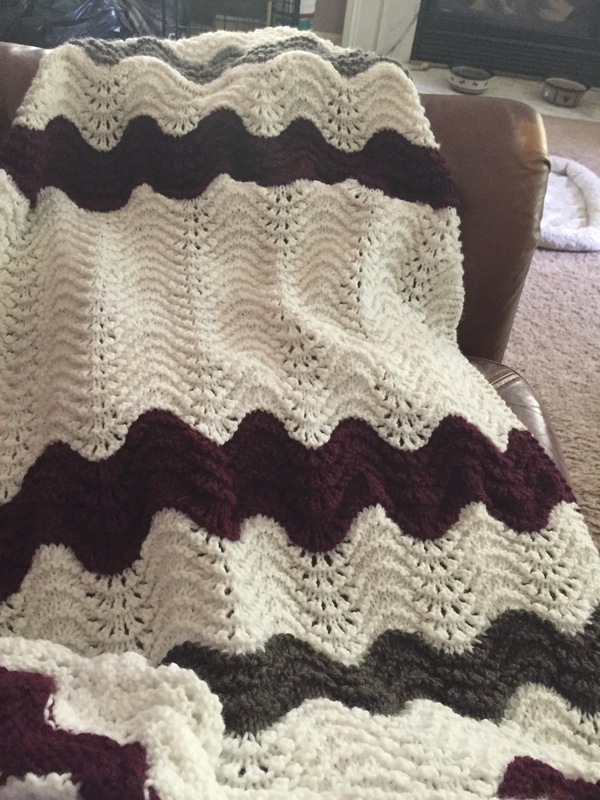 I used Lion Brand Pound of Love in white, Vanna’s Choice in burgundy and charcoal gray heather. I used about 3/4 of the Pound of Love yarn to do the white sections, and 1 skein each of the burgundy and the charcoal gray heather colorways. 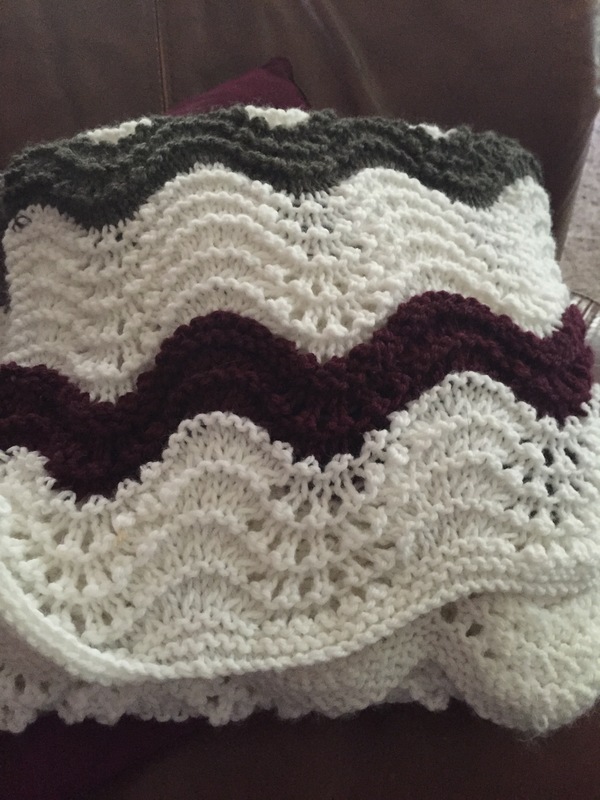 I always completed at least 5 repeats of the white before I added another color to it, and I started out with 2 repeats of the burgundy, then 5 of the white, then 3 repeats of the gray, then 5 of the white, etc. I repeated the colors burgundy with 3 repeats the next time, then 4, then 5. When I got to the middle of the afghan, when I was at the halfway mark, I did 18 repeats of the white before I started doing the end of it, and I repeated the color changes like they were in the beginning so that they would match when it was folded. I am quite happy with the end result. I hope you enjoy the pictures as much I enjoyed doing this pattern. I don’t know that I will do it again because I just don’t tend to do a pattern more than 1 time. Maybe if I put some distance in between now and the next time I do it, it will feel like a brand new pattern to me. Who knows? On another thought, I found out this weekend who taught me how to knit! It was my Aunt Katsuko. She taught me how to cast on and off and how to knit and purl when I was 15. My brother, Mike, and I stayed with her and my uncle for 2 weeks in the summer, and she taught me how to knit then. She does a lot of crochet as that is her preference, but I don’t do crochet. She tried to teach me how to crochet, but it just didn’t take with me and it hasn’t yet. I know how to do a chain stitch and a single, double, and triple crochet but I just don’t like doing it. It doesn’t bring me joy like knitting does. Even still, knitting didn’t take until 2010. Since then, I have been going strong knitting and purling my fingers off since Thanksgiving 2010. Oddly enough, another aunt got me back into knitting. That was my aunt Dorcas. She started to show me how to knit and purl and cast on and off, and my muscle memory took off and I have not looked back since. When did you learn to knit and when did it take for you? How old were you?